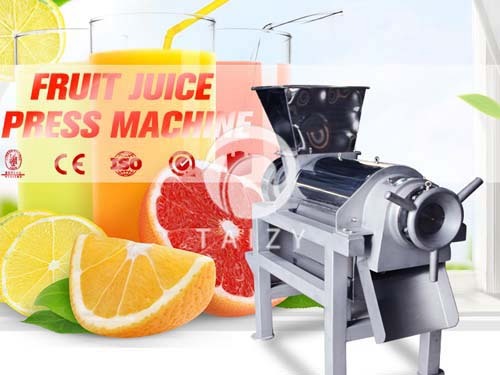 Fruit peeler machine is mainly used for peeling watermelon, and can also be used for peeling small melons such as papaya, taro, cantaloupe, melon, grapefruit and so on. 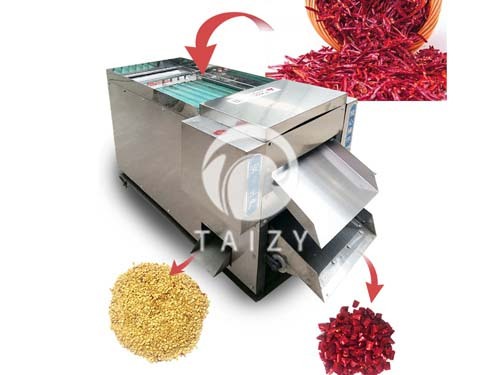 This machine is made of full stainless steel and meets the requirements of food processing. It has a wide range of applications. The knife group circulates up and down, and the cutting efficiency is high. 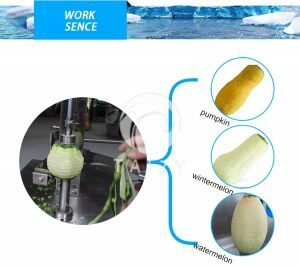 The watermelon peeler can Improve labor efficiency and processing quality, and improve labor intensive. Peeling rate is over 95%. The watermelon peeler is easy to clean and is easy to operate. 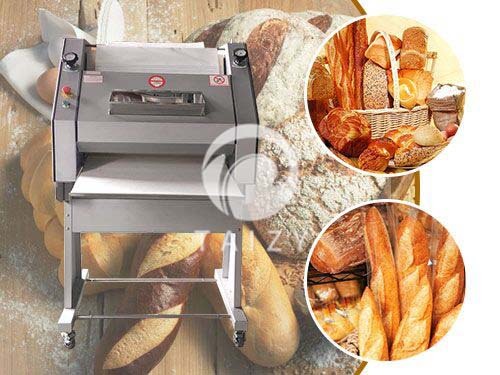 It has the advantages of low power consumption, safe and sanitary, which is suitable for the catering industry, canteens, food processing plants use. The peeling thickness is adjustable to the watermelon peeler. 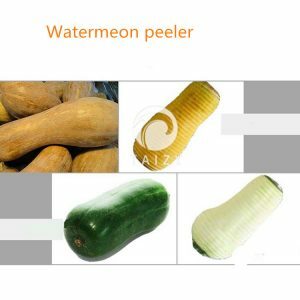 Different watermelons, the thickness of the skin is different, Different melons, the thickness of the skin are also not the same. The peeling thickness adjustment range is 1-12mm. 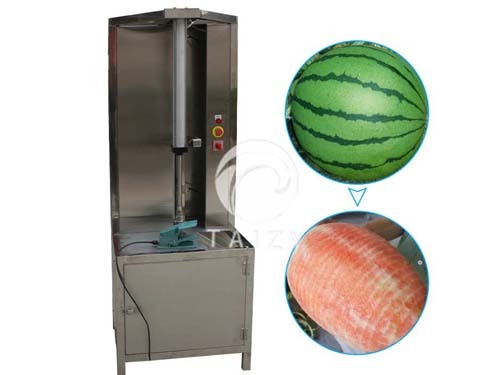 Therefore, the fruit peeler machine is suitable for thin skin and thick skin melons. The method of adjustment is very simple. You need to adjust the screw, the knife head is turned to the left and the skin is thick. The knife head is turned to the right and the skin is thin. The blade is made of stainless steel with a long life service. The raw material peeling diameter range is 50-350mm, the peeling height range is 20-500mm. 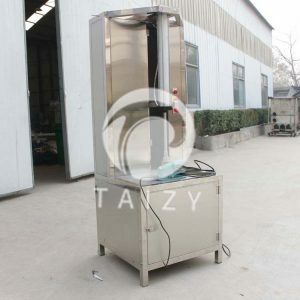 Open the back door of the machine, there is a black button, you can adjust the peeling height of this button due to different kinds of fruits. This machine needs to be equipped with an 800-watt air compressor addition. In addition, the peeling speed of the watermelon peeler is adjustable. Generally, 6-10 watermelons can be cut in one minute. It is also related to the size of the fruit. When the watermelon is working, the motor provides power to drive the gear shaft to rotate. Thereby driving the fruit inserted on the tray to rotate. Fruit stands can be adjusted up and down according to the actual size of the fruit. The thimble on the stand is inserted into the fruit to make the fruit firmer. The gear shaft meshes with the gear, and gear drives the screw rod of a downward spiral, thereby driving the knife rest connected to the screw rod to move downward. The blade rubs against the surface of the fruit, making it easy to cut the peel. As the knife rest continues to fall, the peel of the fruit is separated from the pulp to realize the automation of fruit peeling. After multiple processes of grinding, it creates a smooth appearance. 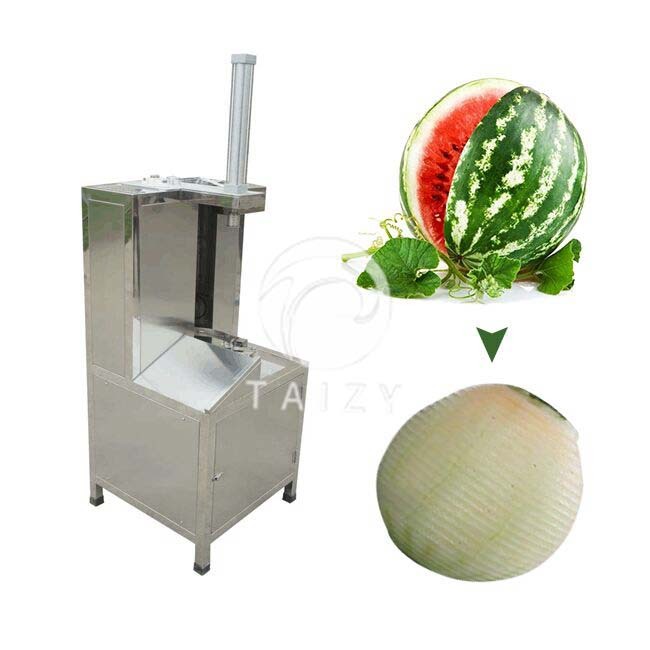 Zhengzhou Taizy Trading Co., Ltd. is specialized in the food processing equipment,especially watermelon peeler & fruit peeler Such as fruit processing equipment, meat processing equipment, vegetable processing equipment, etc. We are committed to producing machines based on the principle of quality first and customer first. We have been exporting to Europe, Southeast Asia, Africa, the Middle East, South America, and other regions. 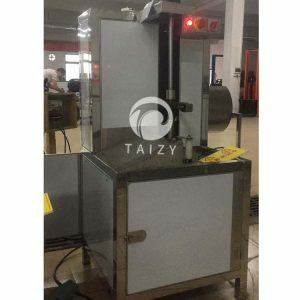 Our machine is deeply trusted by our customers, the quality of the machine has also been praised by customers.